Audio-Technica, a leading innovator in transducer technology for over 45 years, is enhancing its highly successful 2000 Series wireless systems with several new products and technology updates, including the ATW-R2100a receiver, the ATW-T210a body-pack transmitter and the ATW-T220a handheld transmitter. The 2000 Series frequency-agile True Diversity UHF wireless system delivers professional audio and RF performance unheard of in its class, and the new series enhancements update and broaden that functionality. Straightforward setup, automatic scanning, and other advanced wireless features bring the systems performance to a standard that provides the audio quality and reliability necessary for the quality sound systems of today. The ATW-R2100a receiver features automatic frequency scanning that eliminates the need for searching for clear channels by automatically selecting the most appropriate frequency for the area in which the wireless is operating. A pre-coordinated integral channel plan allows for simultaneous operation of any of the ten channels in a given location, in one of two UHF frequency ranges. True diversity operation selects the better signal from the two receiver sections, reducing dropouts. The flexibility in programming both the receiver and transmitters eliminates confusing frequency groups and other frequency coordination problems. Advanced Tone Lock adjustable squelch system fights interference. 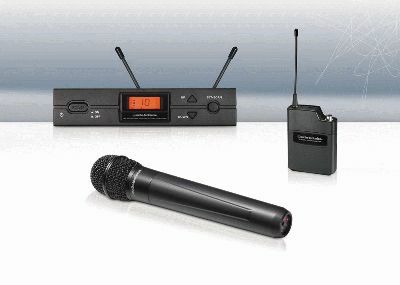 The receiver includes balanced XLR-type and unbalanced 1/4" output connections, enabling use with a wide variety of audio gear; ground-lift switch on XLR-type output, helping eliminate audible hum caused by ground loops between the sound system and receiver; metal receiver construction; rack mount kit and detachable UHF receiver antennas; field-replaceable body-pack transmitter antenna; high-pass filter; adjustable squelch; soft-touch controls and LCD display; and control of input sensitivity. A two-position switch turns on/off 12V AC antenna power for use with powered antennas or other in-line RF devices and accessories. The ATW-T210a UniPak body-pack transmitter features a latching cover to protect the internal controls from being accidentally activated and a recessed four-pin HRS-type locking input connector to increase the life of the microphone cable. Inputs are available on the transmitter for low impedance microphone, and high impedance musical instrument or line input. The transmitter supplies DC bias voltage to power condenser microphones. A straightforward recessed power/mute switch allows for operation without the need to look at the transmitter. A red LED power/battery indicator glows when the transmitter is turned on and the batteries are in operating condition. An RF power select switch offers high and low settings.